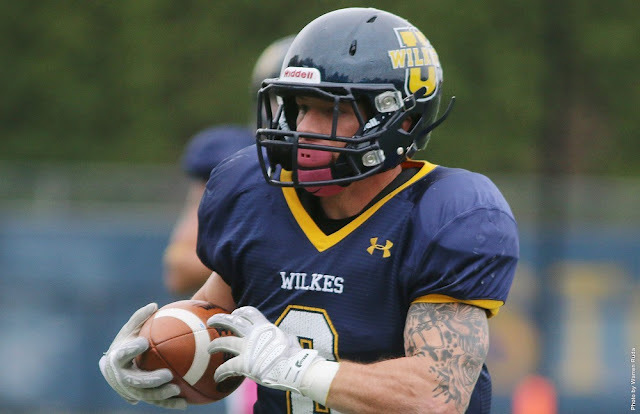 ANNVILLE, PA – Wilkes University senior standout wide receiver William Deemer was named the Middle Atlantic Conference (MAC) Offensive Player of the Week as announced by the conference office Sunday morning. Deemer had an impressive day to lead the Colonels to their first conference win of the season on Saturday. Deemer hauled in a season and game-high nine catches for 168 yards and two touchdowns in Wilkes’ 46-23 win over Misericordia. The senior had a team-best 37-yard catch on a 3rd-and-14 late in the first quarter on the drive where he hauled in his first touchdown of the game to give the Colonels a 16-0 lead. After a 16-0 run with two two-point conversions by Misericordia, Deemer caught his second touchdown late in the fourth quarter to put the game away. Deemer averaged 18.7 yards per catch in the victory. Deemer and the Colonels travel to MAC foe Widener University on Saturday with kickoff slated for 1:00 p.m. in Chester, Pa.